Seattle's seven district-based City Council seats will be contested next year for only the second time. But Rob Johnson, an upzones and bike-lanes booster whose District 4 includes Eastlake, Wallingford, the University District and Northeast Seattle, won't be on the ballot. Seattle’s pivotal 2019 elections are still nearly a year away, but the City Council already is starting to change. Rob Johnson has decided he won’t seek a second term next year, the council member said in an interview. The choice by Johnson — an upzones and bike lanes booster whose District 4 includes Eastlake, Wallingford, the University District and northeast Seattle — is the first major news in what should be a competitive 2019 cycle. The city’s seven district-based seats will be contested for only the second time, requiring incumbents to answer to their neighborhood constituents, and battle lines on homelessness were drawn months ago when the council adopted a controversial head tax on large businesses to address the ongoing crisis. The council sidestepped a business-backed referendum on the tax by repealing the measure, but the upcoming races will give voters a chance to make themselves heard at City Hall. San Francisco voters Tuesday approved a tax on large businesses to combat homelessness. 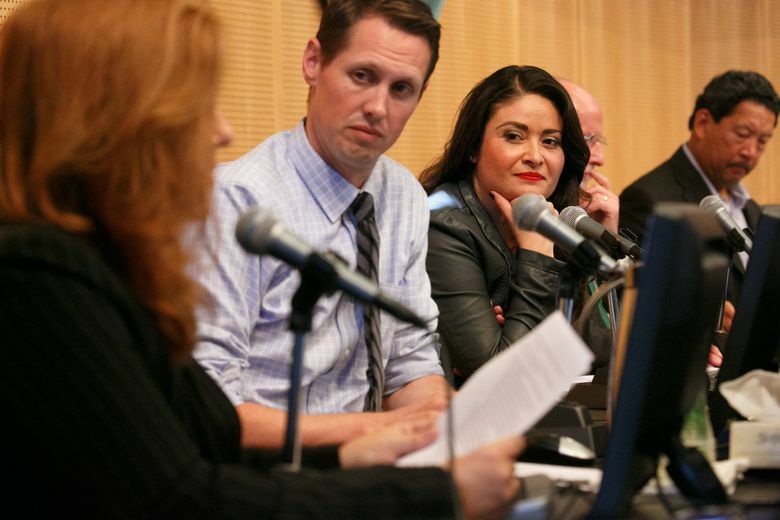 Seattle council members who bow out, typically are ending long careers. When they decided against running for re-election in 2015, Nick Licata had served five terms and Tom Rasmussen and Sally Clark both had served three. That makes Johnson an anomaly, deciding to quit City Hall after only one term. But the 40-year-old father of three said his reasons include “the worst of political cliches”: He wants to spend more time with his family. Johnson promised his wife he would stay in the job only four years, he said. “That was a conversation Katie and I had early on,” said the council member, previously a lobbyist for walking, biking and transit projects. Johnson said his primary goals as a council member and Sound Transit board member have been to help pass a $290 million housing levy and a $54 billion light-rail measure on the ballot in 2016, to support the $600 million-plus education levy that passed Tuesday and to shepherd upzones through the council. The three tax increases all now have passed, and the council voted unanimously in 2017 to adopt upzones for the University District, downtown and South Lake Union, the Chinatown International District, Lower Queen Anne/Uptown and some Central District intersections. In exchange for allowing larger buildings, the upzones are triggering a policy that requires developers to include or pay for some low-income housing. Johnson had hoped the council would have by now also adopted upzones for Seattle’s 27 remaining urban villages. But neighborhood conversations and legal protests have delayed those. Some constituents will be happy to see Johnson go, including those who think the tax hikes he supported are making Seattle too costly. The council member might have had to contend with a challenger supported by the group had he run for re-election, and Johnson said there will be some relief in stepping away. “It will be nice to be a dad on the playground and just be a dad,” he said. Still, the council member said he continues to receive support from the labor, business and environmental organizations that backed him in 2015. Councilmember Teresa Mosqueda, a citywide representative, won with similar backing last year. “I do think I could win,” Johnson said. Bruce Harrell, Mike O’Brien and Sally Bagshaw are the veterans on the council, with Bagshaw the most likely to eschew another run. The former prosecutor, whose District 7 includes downtown, Queen Anne and Magnolia, is 67 years old and was first elected in 2009. Harrell and O’Brien could have tough races, with the District 2 rep possibly more vulnerable to a challenge from the left and the District 6 rep perhaps more vulnerable to a challenge from the right, respectively. Harrell is the council’s president and represents southeast Seattle. O’Brien repeatedly has caught flak from some residents and business owners in Ballard over a gentle approach to homeless camping they see as ineffective, among other issues. Lisa Herbold, whose District 1 encompasses West Seattle and South Park, and Debora Juarez, whose District 5 covers north Seattle, have been particularly vocal about boosting services in their areas, which could shield them next year. The council moved to district elections for seven seats in 2015 after more than a century with only citywide reps. Whether Kshama Sawant holds onto her seat could depend on whether a candidate emerges who can garner support from both business and labor leaders. The Socialist Alternative Party council member’s District 3 includes Capitol Hill, the Central District and Madison Park. Some new candidates have registered campaigns, with more expected to declare later in late 2018 and early next year. In an interview, citywide Councilmember M. Lorena González said City Hall will miss Johnson’s perspective as a public-school parent. Though they disagreed at times on the head tax, González said she and Johnson worked together this year to secure levy money for elementary-school programs. The District 4 winner will be the candidate who voters trust to implement large-scale projects, Johnson predicted. In 2020, Lincoln High School will reopen, and in 2021, light-rail stations will open in the University District and in Roosevelt, he said.